The Learning Styles Profiler Software (LSP) is the computerised version of the evidence based Hybrid Model of Learning in Personality designed by Professor Chris J. Jackson. This evidence based and theory driven model of learning is suitable for business, education, community and clinical use. Use the Hybrid Model of Learning to understand how people learn (including diagnosing functional and dysfunctional learners) and how to help them become more effective learners. 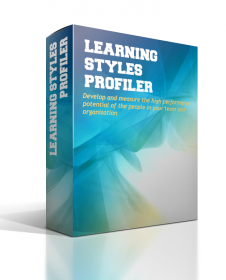 The Learning Styles Profiler is widely used around the world to assess and develop the way people learn at work. Twelve years of academic and applied organisational research have gone into the development of this instrument. Based on a well-developed evidence based theory driven model of the neuropsychology of learning. Based on the most up to date and validated biological theory of learning. Has a better theoretical and design pedigree than any other learning styles questionnaire for business and education. Read the detailed and fully referenced section on the development of the LSP based on the neuropsychology of the brain and be reassured by the sophisticated psychometric properties of the LSP which are also fully reported. Measures real psychological processes. Goes beyond the weaknesses of the learning cycle. The free version is for personal use. Corporate and commercial use must be from a purchased account. Account holders are offered many more administrative functions. The material can be adapted as required.